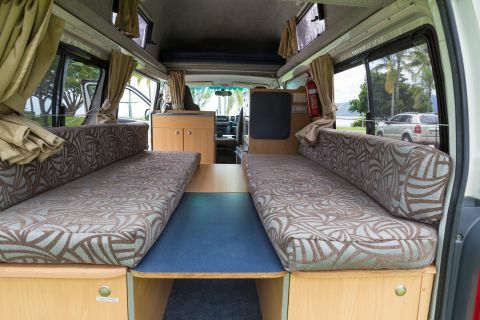 Open the van door and clear the area in the dinette. Located above the dinette are two wooden table tops. Grab one table top and slide it between the two side-facing seats to create half of the bed base. Grab the second wooden table top from the storage area above the dinette. Slide the second wooden table top between the two side-facing seats to finish the base. Ensure both pieces are fixed flush together. Pull the two back cushions across and fill the space in the base, creating the mattress. 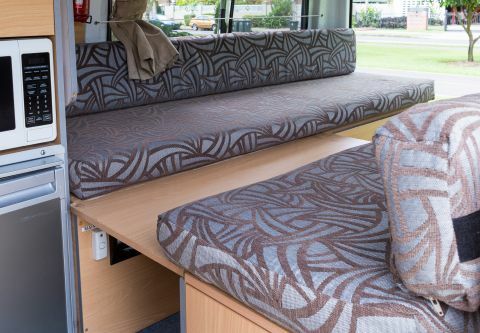 Using the linen provided by Camperman Australia, make the bed and your bed is ready. 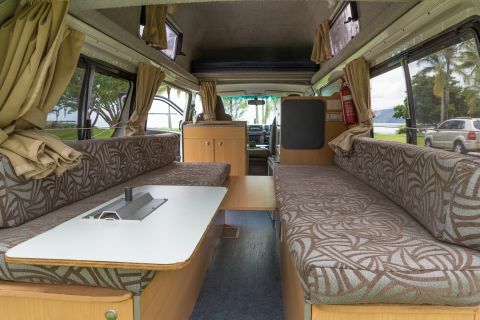 Remove the two table tops and foam mattresses from above the dinette area. 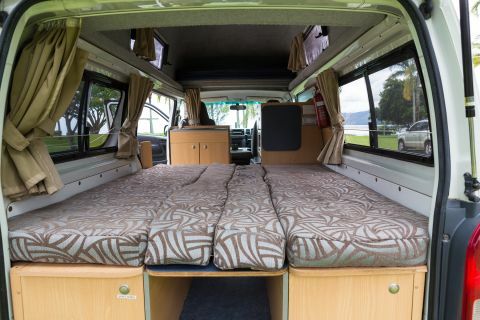 Slide out the bed base onto the runners, which are located on each side of the campervan. Place the foam mattresses on top of the bed base to create the mattress. 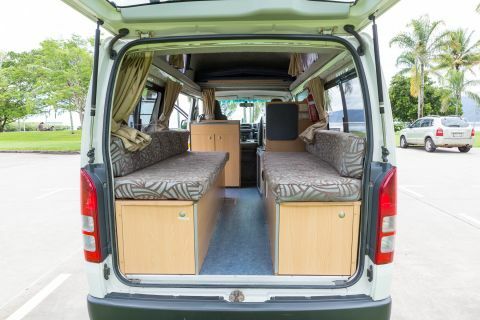 Using the linen provided by Camperman Australia, make the bed. When ready for bed, use the ladder provided to get up onto the bed safely. Open the van door and clear the dinette area. Lift up the cushions on the side-facing seats. In the storage area underneath the seats are two metal poles for the table. Located above the dinette is a wooden table top. Slide the metal pole into the fixture attached to the wooden seat, with the black connector facing upwards. Tighten the pole in place using the black lever. On the second pole are two holes. Place the second pole onto the first hole, with the black connector fitting into the hole. Tighten the pole in place using the black lever. Grab the table top and place on top of the pole, with the black connector fitting into the second hole. Tighten the table top in place using the black lever. Your table top is now in place, ready to eat and drink using the kitchenware provided by Camperman Australia.